Within most breed standards are descriptions of the temperament, structure, and gait each breed requires for performing its traditional "job" most efficiently. The Border Collie breed was developed through selection for a particular creeping, keen-eyed, intimidating style of work. The Preamble to the AKC Border Collie breed standard states: "As a result of this selective breeding, the Border Collie developed the unique working style of gathering and fetching the stock with wide sweeping outruns. The stock is then controlled with an intense gaze known as "eye", coupled with a stalking style of movement." There are other elements in the standard that illustrate the type of physical structure that enables the breed to work as it does: "Forequarters: " There is sufficient width between the tops of the shoulder blades to allow for the characteristic crouch when approaching and moving stock." [When dogs drop their heads lower than their backs, the tops of the shoulder blades move closer together, and if they are too close to each other, the dog cannot sustain the lower head position with any degree of comfort for very long.] "Hindquarters:" Stifles are well turned with strong hocks that may be either parallel or very slightly turned in." [Well bent stifles and hocks are needed to fold the legs under while creeping, crouching, crawling, and give flexibility to the leg.] Under "Gait", the standard states: "The Border Collie"s most used working gaits are the gallop and a moving crouch (stealth) which convert to a balanced and free trot, with minimum lift of the feet. " The head is carried level with or slightly below the withers." All of these statements paint a mental picture of a dog that looks like the photo below. 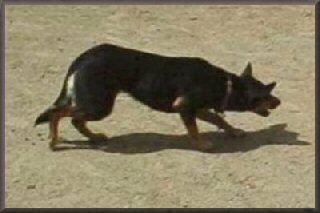 The United Kennel Club standard for the Australian Kelpie, another "eye" breed, has these descriptions, which are very similar to the Border Collie standard: "The topline should show a pronounced rise at the withers to allow for sufficient action of the forequarters. Any tendency toward a level topline is undesirable. "The stifles well turned, the hocks fairly well let down and placed parallel with the tail should form a smooth curve when the dog is standing at rest. Particular emphasis should be placed on the turn of the stifle. Any tendency toward straightness should be considered a very serious fault. " There must be ability to turn suddenly at speed, and the capability of crouching, stealthy movement demanded by its work." The Australian Shepherd was developed on farms/ranches as an all-round working dog, and its physical structure reflects more closely that of a dog intended for use in a variety of jobs, a "jack-of-all-trades", and this is reflected in the breed standard. "Forequarters: The shoulder blades (scapula) are long and flat, CLOSE SET at the withers..." The Aussie is an upright breed when working, which essentially means that the position of comfort is going to be with the head up, rarely dropping below the topline for sustained periods. "Hindquarters: ... Stifles are CLEARLY defined, hock joints moderately bent." The Breed Standard Annotations state: "The stifles in the Aussie are clearly defined rather than acutely bent, the 'well bent' stifle being for speed only and often accompanied by sickle hocks. The moderately bent (well defined) stifle allows for sufficient length of both upper and lower thighs for good leg action and stride, while allowing a moderate bend to the hock joint for the metatarsi to drop straight with the pad of the foot directly under the vertical center of gravity of the rear assembly." 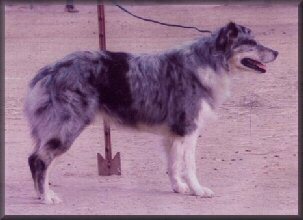 The stifle joints on an Aussie should have definite bend, however, should not be "well turned" or "bent" as is described in the Kelpie and Border Collie standards. Again, those two breeds should have the physical angulation and flexibility in the stifle joint to enable them to work for extended lengths of time creeping, crouching, clapping. While the Aussie can certainly drop to the ground, it isn't natural or comfortable for them to do so repeatedly and/or for long periods of time. "Gait: Smooth, free and easy... as speed increases, the feet, both front and rear, converge toward the center line of gravity of the dog, while the topline remains firm and level." At no point in the breed standard are there any references to the breed standing/moving/working in any position other than normal, upright position with a level topline. This article is intended only to briefly illustrate that canine structure is the result of genetic selection for physical/mental traits , whether that selection occurs gradually in nature, or is controlled and manipulated by Man. Breeders of purebred dogs have a responsibility to insure that their breeding programs place great emphasis on the historical function and purpose of their respective breeds, in order to not lose the essence of those breeds. "The Aussie that does not have sound structure will never realize his full potential, nor will he function effectively as a working dog. The Breed Standard describes the characteristics that enable the Australian Shepherd to accomplish his work with the greatest amount of ease. An Aussie with poor structure will have to work harder and will be less athletic and more prone to injury than one with ideal structure." Jeanne Joy Hartnagle, All About Aussies, 1st edition, pub. 1985, Alpine Publications, p. 7. Copyright 1985 by Jeanne Joy Hartnagle.